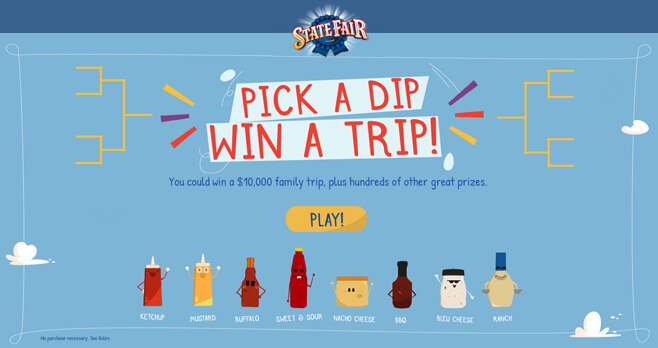 Go to corndogs.com/dipoff and pick your favorite dip during the State Fair Corn Dog Dip-Off Sweepstakes 2018 and you could win a $10,000 family trip, plus hundreds of other great prizes like water bottles, skateboard & helmets or bean bag toss sets. Over 125 winners. More than $15,000 in prizes. Who Can Enter? The State Fair Corn Dog Dip-Off Sweepstakes 2018 is open to legal U.S. residents residing in the 50 contiguous United States and Washington D.C. who are at least the age of majority in their state of primary residence at the time of entry. When To Enter? Sweepstakes begins on March 17, 2018 at 12:00 AM ET and ends on April 29, 2018 at 11:59 PM ET. What Is The Corn Dog Dip-Off Sweepstakes Prize? The Grand Prize consists of a $10,000.00 check for a family vacation. Who Are The State Fair Sweepstakes Winners? To request the name of the Winners(s), please send a self-addressed, stamped business size envelope by 5/15/18 to: State Fair Corn Dog Dip-Off Sweepstakes S7544, 1105 SE 8th St. Grand Rapids MN 55744.